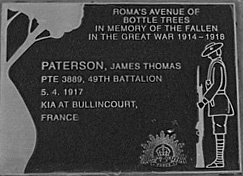 This entry was posted in A to Z 2012, Anzac Day, Military, World War I and tagged A to Z challenge 2012, Anzac Day 2012, Daniel Paterson, James Thomas Paterson, Pickenjennie, Villers-Brettoneux, Wallumbilla, World War I by cassmob. Bookmark the permalink. Pauline, a lovely & very moving post commemorating James Paterson. My own ANZAC Day post is up & V will be up shortly. Lest we Forget. Thanks Julie, I’m uploading some of mine and will go and read yours shortly. A wonderful post Pauline. It brought me to tears. It is devastating enough that James lost his life, but for him to have never know his daughter is heartbreaking. So many other than soldiers have been affected by war, we can only hope it does not happen again. Thanks Tanya, but sorry to have made you sad. In some way I find it consoling that his daughter has lived such a rich life and although Jim never knew her, he has descendants who will carry his name into the future. War is a truly terrible thing, but I fear we are destined to repeat it in some form or another. What a great post Pauline. Visiting Villers-Brettonoux is high on my list of things I must do. One of the men I wrote about for the ANZAC Day Blog Challenge this year, my 1st cousin 3 xremoved is one of the names with no known grave. I just discovered today my partner’s gg uncle is also one of those men with no known grave. It’s sad to see the families of these men, like Lizzie, trying to get information and possesions back. Hi Merron, Yes I read your post the other day but hadn’t got back to comment. I find the pleading letters from the families so sad -they just wanted some little thing to remember their loved one, or to know what happened to them. Did you watch the Dawn Service from V-B…very evocative. hi Brett, thanks for dropping by. You are one of only a few Kunkel rellies to check the blog out (had been flirting with setting up one especially for the updates to the book). I don’t think you’d told me the story about the confrontation with the sergeants…maybe one for an email correspondence. The copy of his record was given to me at the 2007 reunion at Murphys Creek and it is full of detail. I was surprised/disappointed that key people like Mau weren’t interviewed as he knew Robert well. It seemed odd to me, but then I assumed it was due to war being a crazy place. I did eventually realise it was your Dad you had been “Pat” in Korea per the photograph (thanks for letting me know the link’s now broken). As to my girls, not St Catherine’s..our mob went to Sunnybank Hills school, but yes Margaret taught them for confirmation. Coincidences everywhere. Thanks Brett for your comments…will pursue the Korean issues via email. Don’t know how I missed this in 2012 but very interesting now. About to go and check some details on my own Roma family member who didn’t come back & see if they would have gone on same train. Did you get to or know about the “Roma Remembers” weekend some years back? Our family of Sutton’s had 2nd biggest group there to remember our soldier. I have one branch greatgrandmother’s brother who lost 3 sons plus later lost a daughter murdered by her husband’s brother who came back with lots of problems. Can’t understand how the poor mother got through life after that. 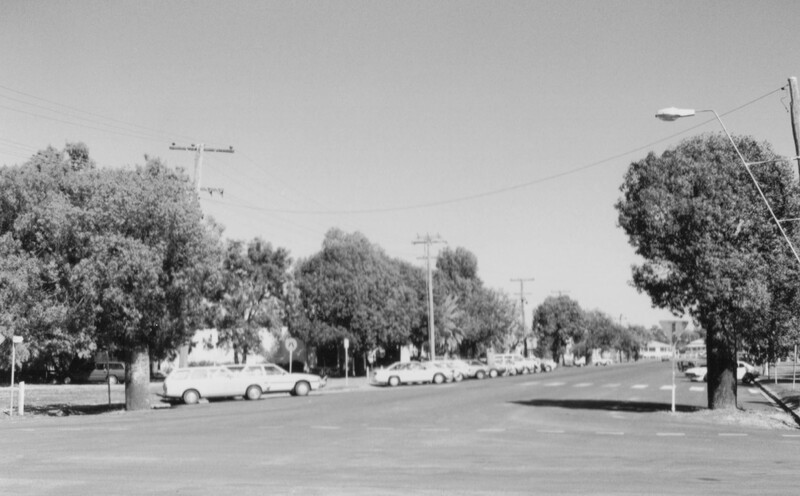 Also is the Julie O’Gorman referred to one who was at school in n Ipswich doing senior 1971. If so she and I were in same class. I also have connection to All Hallows with daughter there for 5 years & numerous concerts as well as friends who were there and even an aunt back in the 40s. Thanks for the wonderful reading material. Thank you for the amazing history lesson. Loved the V post! Thank you for sharing such a moving, beautifully told story. I’m inspired to try and flesh out the stories of our family’s “Anzacs” now; as well as that of my great grandfather who fought with the Gordon Highlanders in France and lost a leg there. Thanks Suzysu. I’m pleased the story worked. It’s very rewarding to learn more about our family’s military service. I’d imagine the Gordon Highlanders might have good records too. A moving story for another brave soul. It’s so hard to imagine the heartache of waiting for news. Wonderful post and photos! It’s so sad to think about how war can impact families. 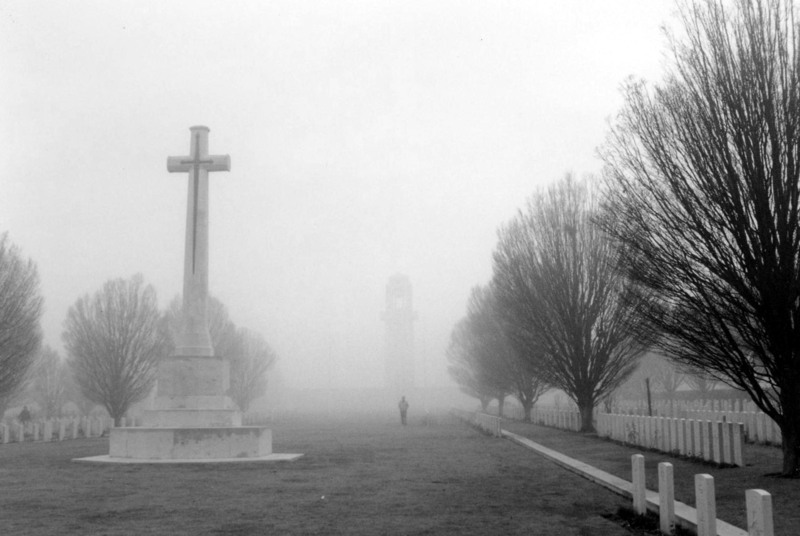 I especially like the picture of the foggy cemetery. Somehow the murky weather seems so appropriate. Thanks Sheryl, the mood on the day as captured in the photos seemed entirely appropriate to the pall of sadness. Oh dear… I’ve read and re-read this post and don’t mind admitting to shedding a tear, or two. Thanks for telling such a sad story so beautifully and with such compassion. 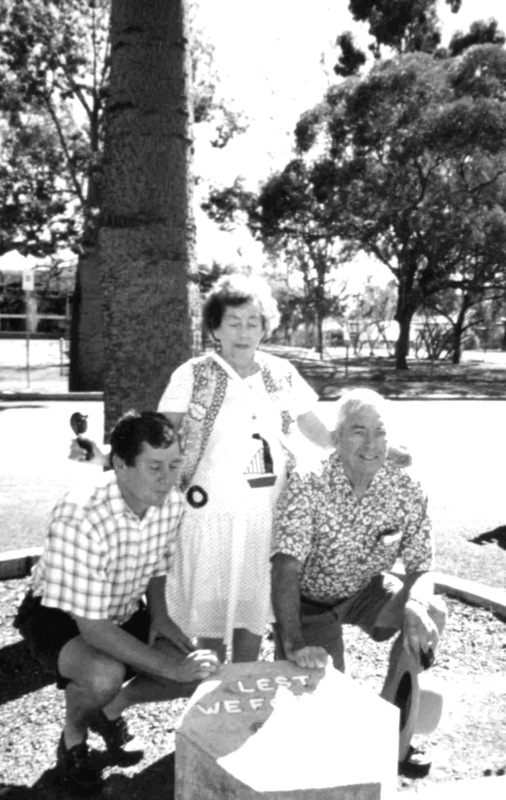 So many young men… so many fatherless children and so many women left to raise families on their own 😦 Specaial thanks for sharing the story of your James Thomas Paterson, Pauline. My husband’s grandfather was “on the Somme” that terrible winter, sufferred with pleurisy, sent to England then repatriated to Australia and discharged. He was a “lucky one” … refused to talk about the war… served the in RSL & respected the Salvation Army. However,my paternal grandmother’s brother, John Ogilvie, served the entire war in 6th Batt, East Yorkshire Regiment and was KIA just 6 months before the end… leaving his wife to raise their 5 children, aged 1-11, alone. 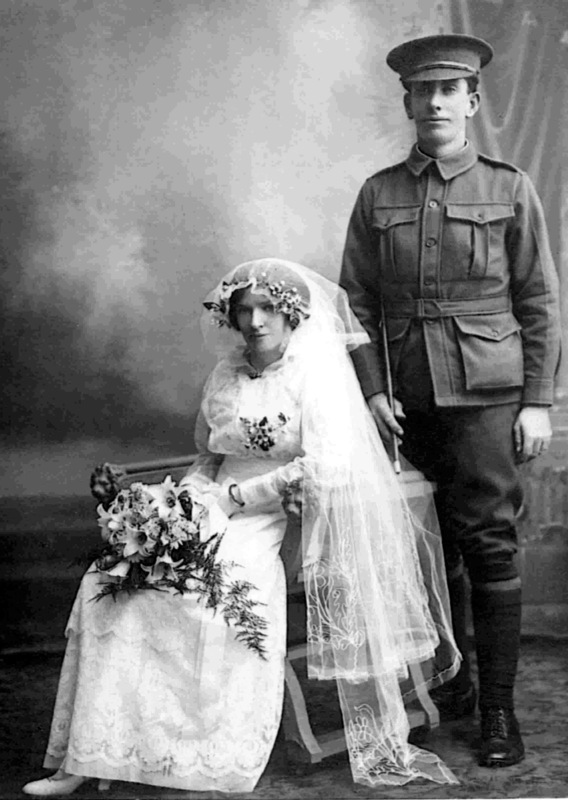 She, like so many War Widows, did a truly amazing job – 10,765 young Australians with no known grave!… Lest We Forget! Thanks Catherine, though I’m sorry to have made you sad. It’s impossible to truly calculate the social cost of the war in such a small country as ours, and New Zealand. Even the lucky ones weren’t all that lucky but I guess when they thought of their mates they knew they were. Poor John Ogilvie’s wife. I can identify with that Catherine! Some days I wish I didn’t cry so easily though. a lovely poignant story– and my history and geography lesson as well. Hi Joan, I’m sure the US servicemen were in many places but I know they were in Brisbane and Townsville. Townsville is possible for malaria but I wouldn’t have thought it common. Seems more likely he went on to somewhere in the Pacific and got it there but if he said he got it in Oz then I’d suspect Townsville. Cairns is another possibility but not sure if they were up that far. Hard to be know isn’t it, and frustrating when you can’t get his records. A great post Pauline. We have a surname in common – where did your Patersons come from? I haven’t really spent much time on the Patersons as they are a connected line. Archibald Paterson was born Dover, England. I might be 12 months late visiting this post but it will be just as moving in another 10 years. 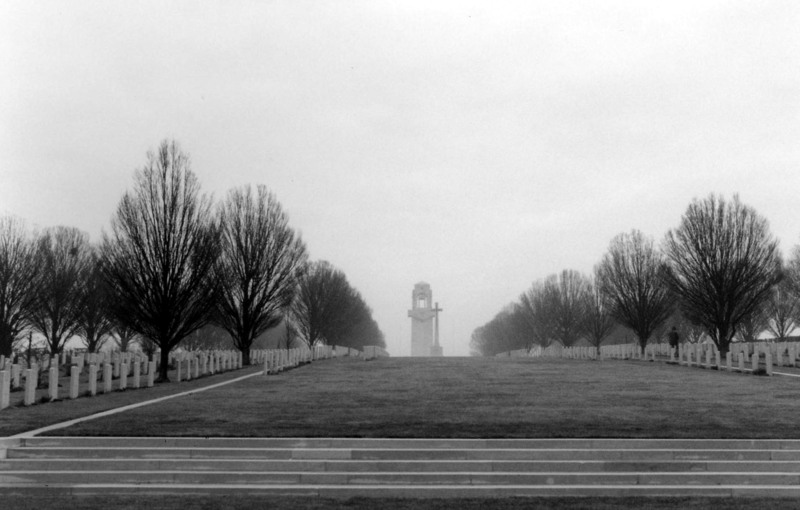 One day I will visit Ypres and the memorial to several family members whose bodies were never located. I think I will need to take a box of tissues as I get tears just watching the services on TV. hi Sharon, thanks for your comments. We visited V-B in mid-November on a freezing morning and I was in tears at the cemetery to see so many young men’s graves. I’d seen war cemeteries before but there was something so evocative about being there as the frost crackled on the ground and thinking of young men from the Australian bush fighting in those conditions so far from home. Hi Pauleen – a couple of years later … I am participating in my first A to Z challenge and will be writing about Villers-Brettoneux as in 2014 the letter V falls on ANZAC day as it did in 2012.
hi Anne, I look forward to it and will have to catch up on your posts so far. It is indeed a challenge doing the whole A to Z thing. Thanks. 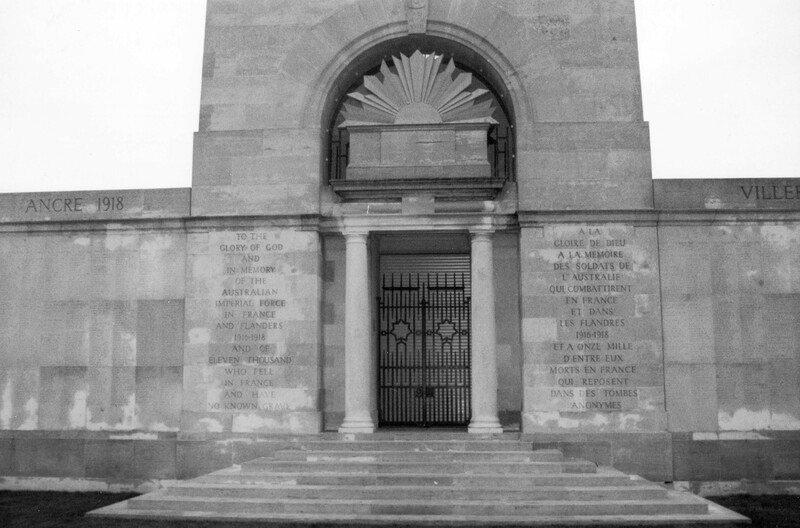 My post is at http://ayfamilyhistory.blogspot.com.au/2014/04/v-is-for-villers-bretonneux.html The challenge is now finished and I can catch up with all the things that have been let slide over the month. It was a very busy time but I enjoyed researching a wide variety of stories. I don’t know that I could do it again though – I would have run out of ideas for some letters! Last year we were in Veillers-Bretonneux at the Australian National Memorial. I am looking at the photos and it was sunny and warm (April). The peace and tranquillity of the surrounding area contrasted with what it must have been like in WWI. We were on a two day tour that took us to the Somme Museum at Albert, the Lochnagar Crater, Pozieres, the Newfoundland Memorial, Fricourt German Cemetery, Arras, Bullecourt, Fromelles and Ypres. It was a 70th birthday wish of my husbands that we go to the WWI Battlefields. He had a great uncle who fought there and survived but he didn’t ever marry or have children. I wonder what his life was like when he returned? Maybe he never recovered from the trauma of war. Thanks for commenting Linda. I found our visit very moving and got a lot from our Battlefields tour in 2014 as well. I wonder how any of the men came home sane to be honest. You took very beautiful and evocative photos of Villers Brettoneux Pauleen. Thanks Alex…I found it a very moving experience. So nice to reshare this post on ANZAC day. One day I hope to visit some of the memorials in Europe too. Your photos brought back memories of our first visit to V-B on a cold wintry January day. Standing there in the biting wind brought me undone as I reflected on the conditions our young men had to endure. Thanks for sharing James’ story..